Majesty is the enthralling story of the House of Winsdor, focussing on the personal and political intrigues that have characterized the reign of Elizabeth II. 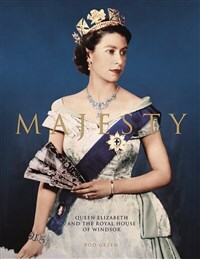 Explore how the Queen has become a symbol of stability in a rapidly shifting world. Fully illustrated with contemporary photographs, it describes the fluctuating fortunes of the Windsors, from the dramatic abdication of the Queen's uncle, Edward VIII, to the tumultuous relationship between Prince Charles and Princess Diana. Set against the colourful backdrop of key events - such as the "Great Smog" that brought London to a halt in 1952; the IRA murder of Lord Mountbatten during the Northern Ireland "Troubles"; the crisis triggered by the death of Princess Diana; the wedding of Prince William to "commoner" Kate Middleton; and the changing face of world politics - this is the story not only of a family, but also a history of our times. Rod Green is a writer with a love of cars spanning 50 years. He is the author of Building the Titanic (Carlton), Scalextric: The Story of the World’s Favourite Model Racing Cars (Harper Collins UK), and The Original Highway Code (Michael O'Mara Publications).